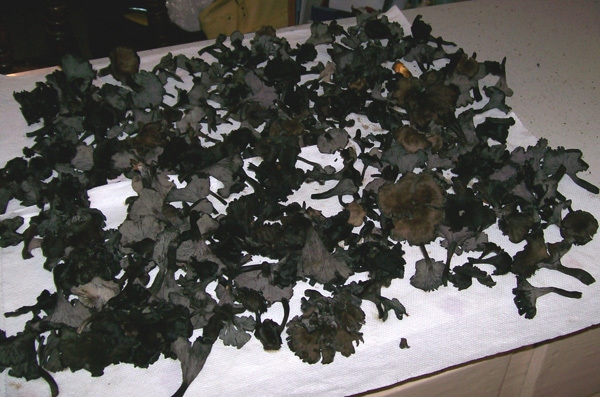 Black Trumpets, Trumpet of Death ( due to it's somber coloring, not it's gastronomic excellence ) and Poor Man's Truffle are some of the names used for these fungi. Here is a nice fresh trumpet. It will get more somber - darker - but still excellent eating. Many times they get to be almost black in color. 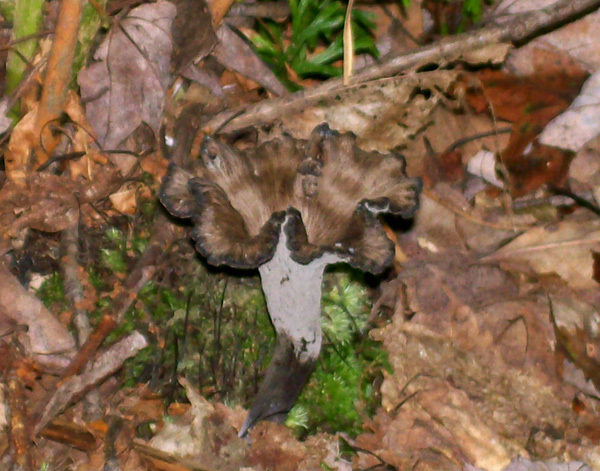 The bottoms have blunt ridges or very small pertubations even smaller than blunt ridges and appear frosted dark gray. No gills on these. They can be described as having a 'Flower-like' appearance. Here is a small group ready for picking. These are tough to find even when you are diligently looking. It's a lot like looking for black morels in early April. 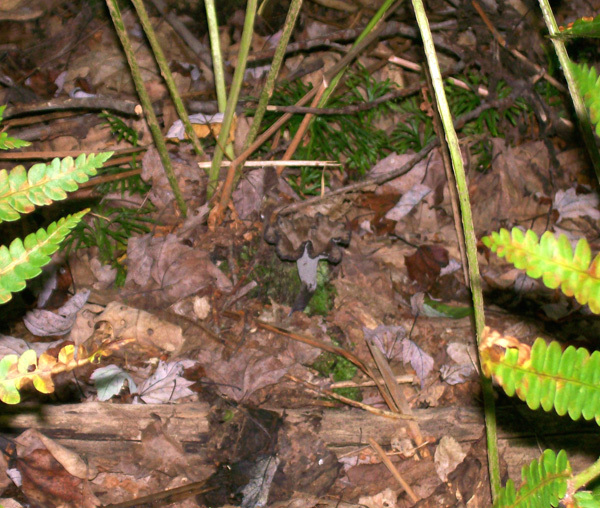 They hide so well - mostly - unless they are in the thick green moss as the photo above depicts. Can you find the trumpet in the photo below? And they grow in the darndest spots! Check this photo. 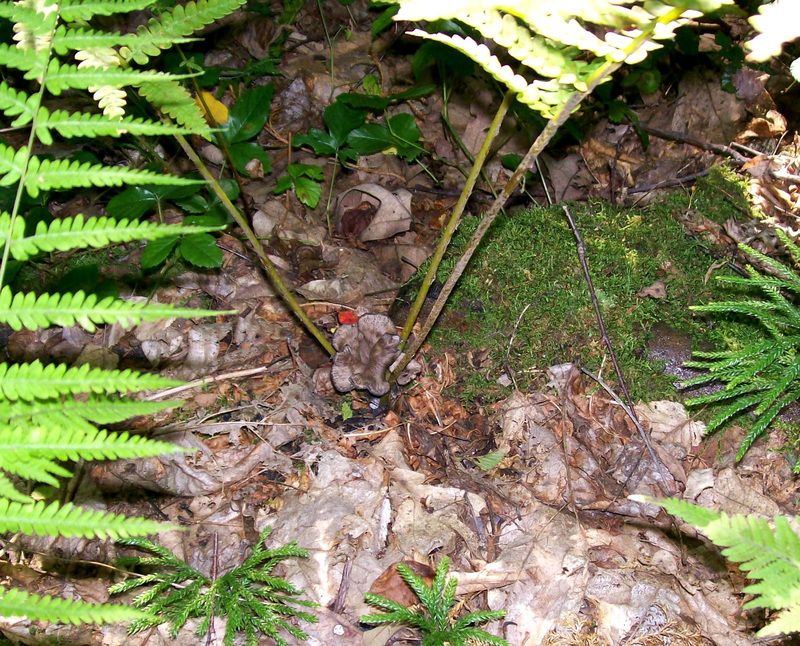 Yup - right between the stems of the fern fronds. Click the photo to see it closer. Many times I thought I found one and upon bending over discovered it to be a curled up leaf. Of course on other occasions I thought I saw a curled up leaf and upon looking closer discovered it to be that elusive trumpet. Best practice when finding one? Squat down next to the one you found ( so as not to lose it ) and look around. In a few seconds your eyes will become accustomed to spotting them and all of a sudden you will see them surrounding you - again just like morels. 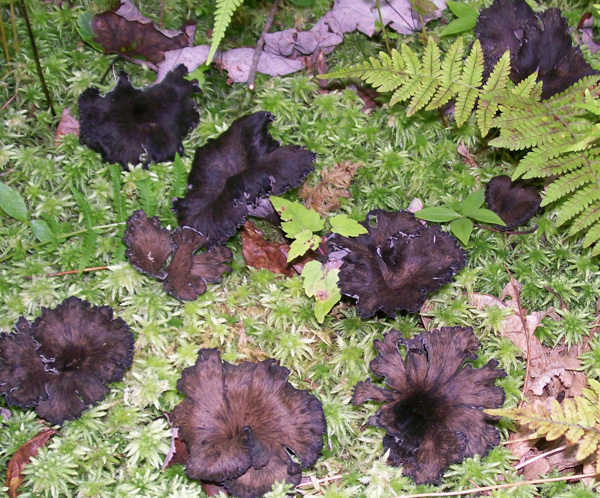 Black Trumpets are common in Pennsylvania but you have to know where to look for these in the habitat they grow, again just like morels. You should look in mixed deciduous woods but preferably with more oak and beech trees in the mix. Find a creek or spring seep and follow along it. If you get a large quantity, like I did August 26, spread them out on some paper towels and let the fan blow over them all night. When you get up in the morning to go to the hotspot to pick more the bunch on the counter will be perfectly done. 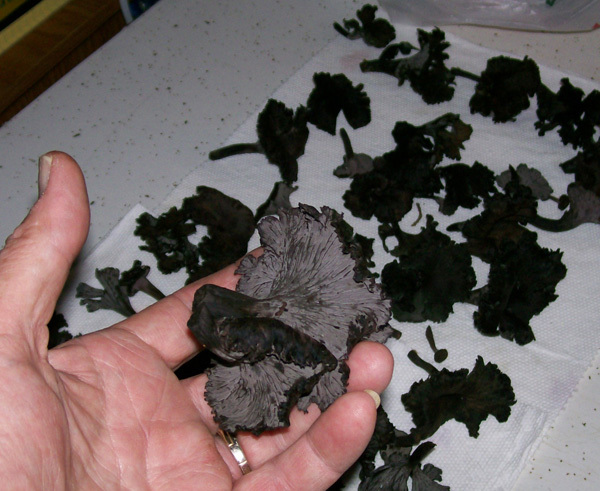 So, what do you do with these Black Trumpets? You can treat them just like any other mushroom if you wish OR you can really stretch them by using them as a flavor enhancer. They are called ' Poor Man's Truffle ' because they have such a rich mushroom flavor and aroma, they are affordable ( us poor people can find them ) AND you don't need a trained Truffle pig or $10,000 Truffle hound to find them. Grind some up and add to mushroom soup made with other mushrooms you have in greater abundance. 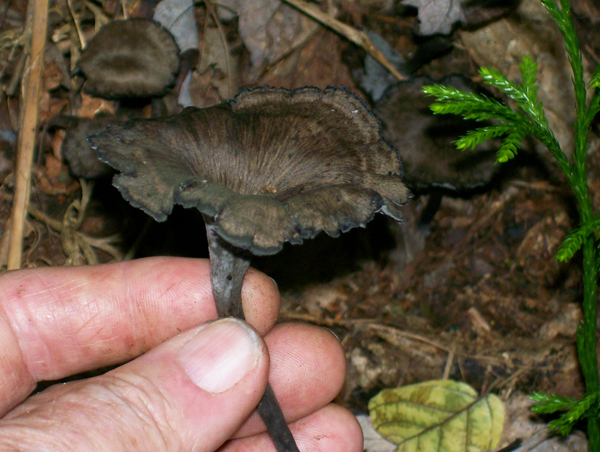 Craterellus fallax - A/K/A - Black Trumpet, Trumpet of Death, Poor Man's Truffle and sometimes Horn of Plenty ( although that is more aptly applied to C. cornucopioides ). DATE - August 25, 30, September 2, and 15, 2009. FOUND - 'Near Kregar, Pa. - close to Camp Run. A very lengthy patch (es)( approximately 1/2 mile long ) growing in thick moss and leaf litter along a tributary of Camp Run. Mixed oak and beech forest. 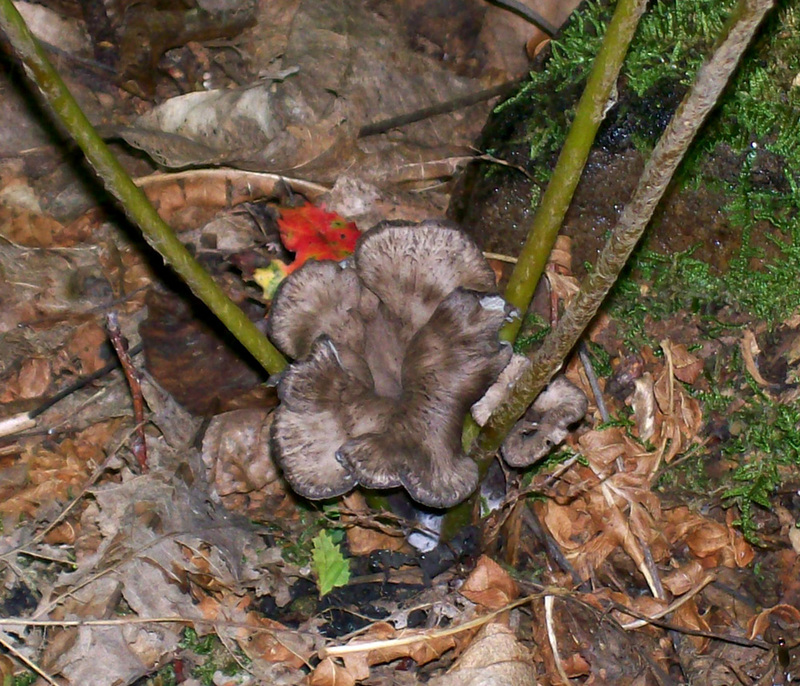 Weather conditions were dry for several days, however these grow in area that is always damp. There are many spring seeps in the creekbed and just about every rock has moss growing on it, as do the banks - even in the driest times.